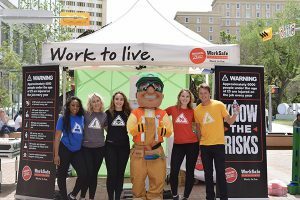 The WorkSafe Street Team shares the Mission: Zero message at events around Saskatchewan . Watch for them in your community! I run a pretty tight ship on my farm as far as safety goes. When you work for yourself, you have to be as certain as can be when it comes to keeping you and your family safe. I’m happy to say we’ve never had a bad accident at our farm. I was one of those statistics, I fell off a combine I was fixing. It needed to get done and I didn’t refuse to do unsafe work so I am glad you are here sending this message. I didn’t realize that people had the right to refuse work if it is dangerous. There are often times where we have done things on a job site, that didn’t seem safe but we did them anyways to get the job done. At my job, we have health and safety meetings nearly every morning. It makes me feel a lot better knowing you guys are out here teaching and showing people what a safe work environment should look like. It’s really important to me to keep my employees safe. We have lots of protocols in place but that’s because it’s instilled in our corporation. I can’t imagine having one of our staff injured on our account. People need to understand not only their rights, but their obligations. We are obligated to keep ourselves safe at work. It’s part of our job, not just the company’s job. I love that you tailor Connect Four questions to the skill level of the people playing. I had so much fun playing against my daughter! 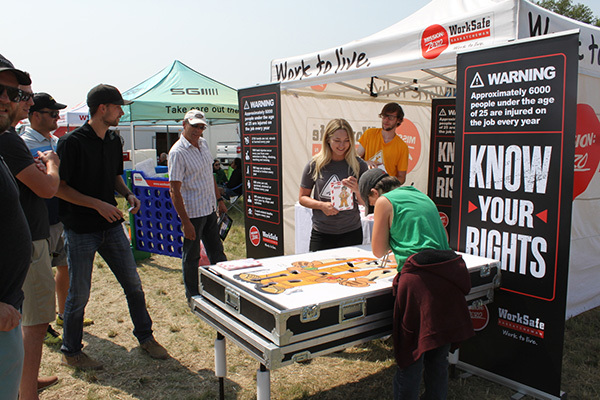 This is so great that you are asking young people questions about work safe practices. It will make them more aware, and better practiced to approach an employer if they feel something isn’t right. It’s so important to know safety practices, and to also practice them. You don’t realize how much a little mistake can make such a big impact on your life. Thanks for telling my kids about the right to refuse work. 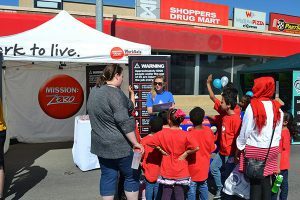 Its great to see an initiative like this making learning safety accessible to young kids. Its so important for those entering the workforce to know that they have rights as a worker. Not only is it good to teach young kids about being safe at their workplaces but often times, adults need reminders too! Thanks! 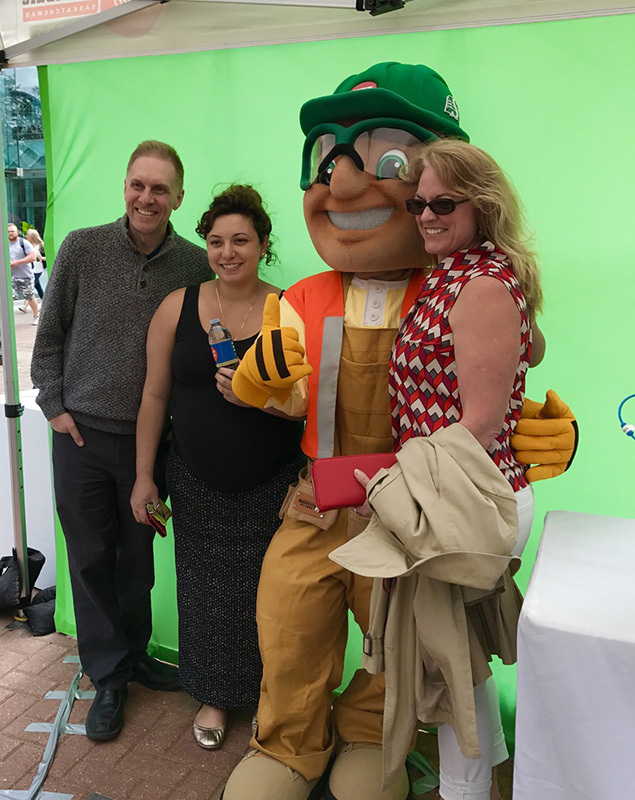 I love seeing WorkSafe out at events because I can always learn something new. I was amazed that my kids didn’t know the answers to some basic safety questions. Having a game like this really opens a parent’s eyes to some of the things they may have forgotten to reinforce for their children. This is a fantastic thing to have at today’s event. 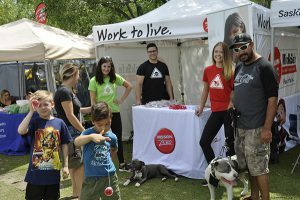 Don’t forget to follow us on Twitter and Facebook for pictures from this summer.